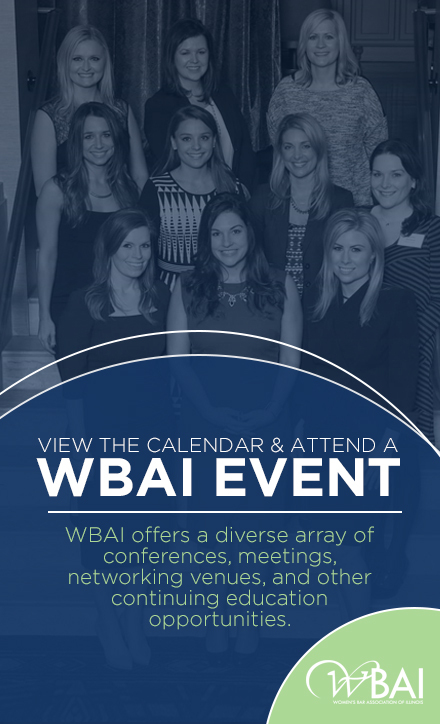 CHICAGO—The Women’s Bar Association of Illinois (WBAI) will kick off a new term of office on Wednesday, June 8, 2016, during its 102nd Annual Installation Dinner at the Chicago Hilton Towers, located at 720 S. Michigan Avenue. The event will feature keynote speaker Mary Cranston and presentation of the Myra Bradwell Woman of Achievement Award to Chief Justice of the Illinois Supreme Court Rita B. Garman. The Annual Dinner serves as one of the largest annual celebrations within the Chicago legal community, with over 700 judges, attorneys, corporate supporters and prominent community leaders in attendance each year. The cocktail reception begins at 5:00 p.m. with dinner to follow at 6:00 p.m. The WBAI is pleased to welcome Mary Cranston as the keynote speaker and recipient of the WBAI’s Women with Vision Award. Ms. Cranston fits all of the award’s criteria with a career demonstrating truly visionary approaches to the legal profession and tireless contributions to the advancement and empowerment of women in the law. Ms. Cranston is now a retired Senior Partner from international law firm Pillsbury Winthrop Shaw Pittman LLP. Ms. Cranston was also named one of “The 100 Most Influential Lawyers in America” by the National Law Journal. Ms. Cranston serves as a director of several public company and nonprofit boards. The WBAI is honored to have Ms. Cranston as our keynote speaker because of her dedication to the WBAI’s core values, and is proud to bestow the Women With Vision Award on her. The WBAI will also honor Illinois Supreme Court Chief Justice Rita B. Garman with the WBAI’s highest award, the Myra Bradwell Woman of Achievement Award, named for the first woman lawyer in Illinois. The award is bestowed on women like Chief Justice Garman who have exemplified excellence in the profession and the practice of law. As the longest-serving female judge in Illinois, Chief Justice Garman’s pioneering career makes her most deserving of this esteemed award. She first practiced as both an Assistant State’s Attorney and in a private firm during a time where she was told that as a woman, she did not belong. Thereafter, Chief Justice Garman served in virtually every judicial capacity from an Associate Circuit Judge (the first woman in her circuit) to a Fourth District Appellate Court Judge. Chief Justice Garman joined the Illinois Supreme Court on February 1, 2001, later unanimously chosen as Chief Justice in 2013, only the second woman to hold the position. Chief Justice Garman has served the people of Illinois with great distinction, and the WBAI is proud to honor her tremendous achievements with the Myra Bradwell Woman of Achievement Award. At the dinner, Adria East Mossing will be installed at the Dinner as incoming WBAI President. Ms. Mossing is a founding partner of Mossing & Navarre, LLC, where she focuses her practice on plaintiffs’ personal injury and complex medial malpractice matters. Ms. Mossing was named one of the “Top 50 Women Lawyers” by Illinois Super Lawyers in 2012 and 2014 and has been recognized as an “Illinois Super Lawyer” numerous times. Alongside incoming President Adria Mossing, the newly elected and returning Officers and Directors will take the oath of office to serve the WBAI for the 2016-2017 bar year. At the dinner, Ms. Mossing will discuss her theme for the new bar year, “We Are the WBAI,” which will focus on highlighting the diversity and unique attributes of the WBAI membership. The WBAI is currently accepting sponsorships for this spectacular event. Several levels of sponsorship are available, and each sponsorship level offers maximum marketing opportunities presented in print, electronically, the WBAI website and social media. The sponsorships range from $1,750 to $7,500, but companies may also purchase advertisements in the program book to support the event. Tickets for the event are $150.00 for Members and $175.00 for Non-Members and are available for purchase online at wbaillinois.org/events/2016ad/. The option to create your own sponsorship is also available, as well as the option to sponsor the Annual Installation Dinner in conjunction with other events and programming throughout the 2016-2017 bar year.